Our Costa Rican partner-farms produce some of the best tasting, consistently high-quality coffee fruit teas. Nestled high in the Las Lajas region, this year's harvest of coffee fruit tea is very well balanced and light in both flavor as well as color. This delicious "Perla Negra" lot of cascara comes from a certified organic farm. This tea will be on the sweeter side, with brighter notes of fruit and honey. 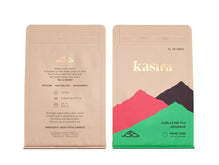 Every whole fruit KASIRA™ pouch contains 3.3oz of premium fruit tea to be brewed in the same way as a normal loose leaf tea.